When you hear the term Attachment Parenting probably the first thing that comes to mind is a zealot, hippie parent who breastfeeds their child until five, who only uses cloth diapers and who carries their baby in a sling 100% of the time. Although these behaviors are true to some degree, yet different for each parent, the overall image in a stereotype and not to be believed. Nor should it deter you from learning about Attachment Parenting. The term Attachment Parenting (AP) was recently coined by author Dr. William Sears, a pediatrician and parent of eight children. The basic thrust of his parenting style is that the connection or attachment between parent and child is the most important component of child rearing. According to Dr. Sears’ website, Attachment Parenting is simply “a style of caring for your infant that brings out the best in the baby and the best in the parents.” It “implies…opening your mind and heart to the individual needs of your baby, and… develop[ing] the wisdom on how to make on-the-spot decisions on what works best for both you and your baby.” Parenting behaviors that are typically encouraged with Attachment Parenting include co-sleeping, baby-wearing, extended breastfeeding and baby-led weaning. Dr. Sears’ ideas about Attachment Parenting are based in part on Attachment Theory which began in the 1950’s when John Bowlby and Mary Ainsworth studied the attachment styles of babies to their caregivers. In their study they observed babies who were briefly separated from their mothers and were left in a room with a stranger for a brief period of time. They filmed the babies while their mothers were gone and when they returned. They later categorized the babies as either securely attached or insecurely attached based on the baby’s behavior when their mom returned. They found that the securely attached babies responded appropriately when they were reunited with their mothers. The insecure babies did not respond well. Some babies became angry at their mothers and others rejected them. The researchers determined that the securely attached babies were ones that were being raised by caregivers who consistently and reliably responded to their babies needs. The researchers learned that it was very important for babies to be responded to on a very consistent basis during the early months of their lives. Other components of AP parenting came about as a result of Dr. Sears observing his wife co-sleeping with one of their newborns. He noticed that his wife’s and baby’s breathing patterns became synchronized while sleeping closely to each other. Dr. Sears began to hypothesize that co-sleeping was beneficial to the baby for several reasons: 1) the mother is immediately available to meet her baby’s needs; 2) the baby’s breathing patterns improve when sleeping with the mother and 3) the sleep patterns of the baby are better when sleeping close to mother. Although I practice the behaviors of a self-identified AP parent and I belong to an online AP parenting group, I do not tell people that I am an AP parent nor do I identify as such. For me, the term Attachment Parenting is a new word for an old concept. Other cultures have been practicing the behaviors defined under Attachment Parenting for thousands of years. Look to any culture other than the U.S. or Europe and you will find mothers carrying babies on their backs, families sleeping together and toddlers nursing—perhaps even from a woman who is not her own mother. Breastfeeding past the age of three is common in many places around the world. It is also only in the U.S. that babies are encouraged to sleep through the night at an early age or to sleep in a separate room from his or her mother. Few societies have houses large enough for each child to have their own room. It’s only been in the past 100 years and in the more “developed” countries that every child having their own room starting at birth has become the norm. It is the way that we have socialized our children in response to wealth and an individualistic society versus a collectivistic society. The one place that Attachment Parenting practices differ most radically is from the socially accepted practice of sleep training or Cry it Out (CIO). Attachment Parenting does not support letting a newborn or young baby cry themselves to sleep because it does not fall under the behavior of meeting their newborns needs repeatedly and consistently. In my opinion, “teaching” a baby to sleep independently is a behavior that we as a western culture have imposed upon our children for the sake of convenience. The individualistic society that we live in socializes children to become independent more quickly and for mothers to separate from their babies and toddlers sooner than is biological or developmentally appropriate. In today’s Euro-American society, parenting has changed to fit the lifestyles of people who work, who want independence from their babies earlier, and who own homes with multiple rooms. If you think about it, the practices associated with Attachment Parenting are probably not that much different than what you are already doing if you are caring for an infant or young child. Most parents admit that they end up sleeping with their babies even if they have a crib set up in the next room. It’s very common to see moms and dads carrying babies in front carriers these days. Even so, it’s not mandatory that you do any of these things. You can be a member of an attachment parenting group just to have solidarity with other parents who want what is best for their baby. The most important thing is that you value the physical and emotional connection that you have with your baby and that you do what is best to meet your baby’s needs. I came across the idea of attachment parenting when our son was about a year old. 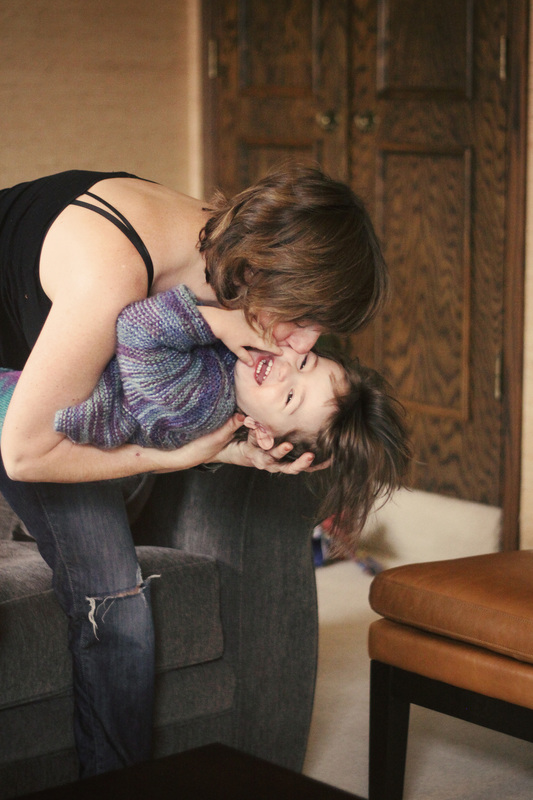 We were doing most of what attachment parenting suggested, so the philosophy made sense to me. It gave approval to what we were already doing, and I guess I needed that approval. it helped to know there was a science based parenting style that supported what we were doing, and strengthened me against the advice of others that just seemed wrong. I don’t follow any specific parenting style hook, line, and sinker. Rather, I do what makes sense and feels right for our family. Yes, I talked about the identity part in my other post. You are right. If offers validation to parenting choices. Thanks for that reminder. I would also add that it is Dr. William Sears that coined the term “Attachment Parenting” , because of all the other doctors named Sears. And though I don’t know for sure, I would suspect that his wife Martha Sears also had a part in coining the term. I really enjoy your blog. When my oldest was born, 17 years ago, I couldn’t put him down. We didn’t have all the bells & whistles when he was born, plus I was told not to let him sleep in our bed by the nurses. I was also told to place him on his tummy while he sleeps. Seems every generation new guidelines emerge. I think Avis & Beulah would be proud to see the love they passed to us carries on to our children. Thank you, Susan! Even with all of the bells and whistles I still couldn’t put my little one down. She wanted nothing to do with any of the swings I had bought. I think you are right – Avis & Beulah (our grandparents) would be proud!